Blog — Naturally Beautiful Wedding Hair + Makeup. Chelmsford. Essex. East London. As featured on 'Wedding Ideas' Magazine. April 2018 issue. 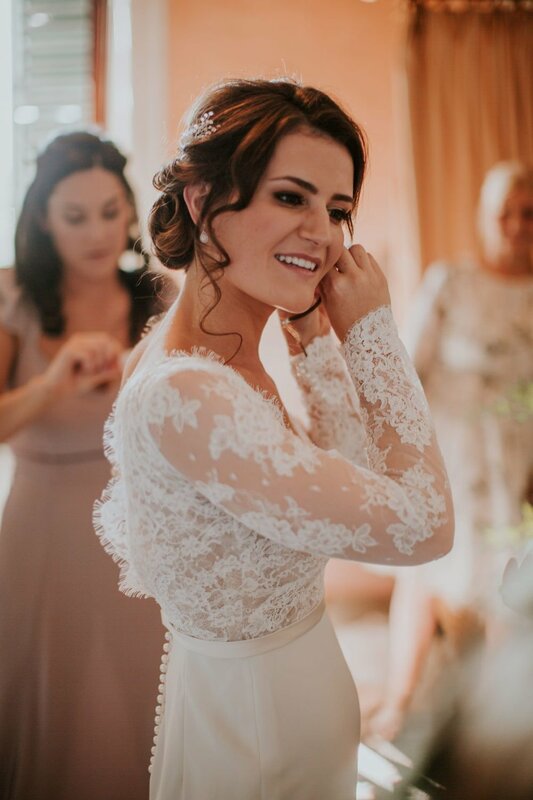 This is probably my FAVOURITE of all the bridal looks I create because it combines elegance with textured hair for that ‘effortlessly beautiful’ feel. ‘Cara’ wears a ‘Grace Loves Lace’ dress which is what inspired the Aussie sea salt hair and natural bronzed skin. My favourite Salt Spray is Bumble + Bumble Surf Spray. This look is all about the ‘no makeup makeup’ which features heavily in the world of fashion. I love combining soft creamy textures for that perfect dewy base and teaming it with effortlessly undone hair which keeps the entire look a lot more casual. This look is perfect for the girls that want to keep everything stripped back and simple. Try adding a hint of Bobbi Brown’s ‘Hydrating Face Cream’ to your foundation for a more natural finish. This look is STRONG and BRAVE. It combines and element of glamour but still keeps the entire look feeling CLASSY. A bold lip is a statement that Brides should totally be embracing this year, if you keep the skin looking natural, you really can’t go wrong. This look is perfect for the playful Bride but if you’re not feeling brave enough to wear this during the day, pack a bold lippy in your clutch bag for the evening instead! My personal favourite is ‘Red Carpet Red’ by Charlotte Tilbury. We’ve seen all things Boho for a while now and to be honest, I don’t think it’s a trend that will ever really fade because it’s just SO pretty! This is all about natural, earthy tones and textures to create that effortlessly pretty vibe. Think neutral tones paired with peachy lips and cheeks! One of my favourite blushers is ‘Melba’ by Mac Cosmetics. Brides that want to feel pretty but not too glam, this ones for you! If you’re wanting to look and feel like the ultimate princess then this look is for you. When you imagine a Bride, this is what most of us picture in our minds which is why this look is absolutely timeless. This is all about HIGHLIGHTING and enhancing your natural beauty so imagine a more polished version of yourself and voila this is it. My favourite highlighter used to enhance the skin is ‘Pearl’ by Mac Cosmetics.